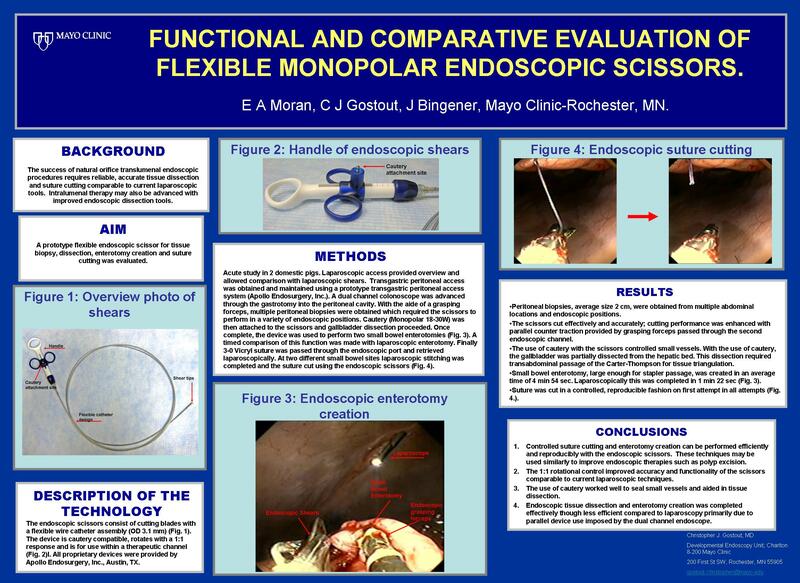 Functional and Comparative Evaluation of Flexible Monopolar Endoscopic Scissors. 1. Objective of the study: The success of natural orifice translumenal endoscopic procedures requires reliable, accurate tissue dissection and suture cutting comparable to current laparoscopic tools. A prototype flexible endoscopic scissor for tissue biopsy, dissection, enterotomy creation and suture cutting was evaluated. 2. Description of the methods: Acute study in 2 domestic pigs. Laparoscopic access provided overview and allowed comparison with laparoscopic shears. The endoscopic scissors (Apollo Endosurgery, Inc.) consist of cutting blades with a flexible wire catheter assembly (OD 3.1 mm). The device is cautery compatible, rotates with a 1:1 response and is for use within a therapeutic channel. Transgastric peritoneal access was obtained and maintained using a prototype transgastric port (Apollo Endosurgery, Inc.). A dual channel colonoscope was advanced through the gastrotomy into the peritoneal cavity. With the aide of a grasping forceps, multiple peritoneal biopsies were obtained which required the scissors to perform in a variety of endoscope positions. Cautery (Monopolar 18-30W) was then attached to the scissors and gallbladder dissection proceeded. Once complete, the device was used to perform two small bowel enterotomies. A timed comparison of this function was made with laparoscopic enterotomy. Finally 3-0 Vicryl suture was passed through the endoscopic port and retrieved laparoscopically. At two different small bowel sites laparoscopic stitching was completed and the suture cut using the endoscopic scissors. 3. Preliminary results: Peritoneal biopsies, average size 2 cm, were obtained from multiple abdominal locations and endoscopic positions. The scissors cut effectively and accurately; cutting performance was enhanced with parallel counter traction provided by grasping forceps passed through the second endoscopic channel. The use of cautery with the scissors controlled small vessels. With the use of cautery, the gallbladder was partially dissected from the hepatic bed. This dissection required transabdominal passage of the Carter-Thompson for tissue triangulation. Small bowel enterotomy, large enough for stapler passage, was created in an average time of 4 min 54 sec. Laparoscopically this was completed in 1 min 22 sec. Suture was cut in a controlled, reproducible fashion on first attempt in all attempts. 4. Conclusions: Controlled suture cutting and enterotomy creation can be performed efficiently and reproducibly with the endoscopic scissors. The 1:1 rotational control improved accuracy and functionality of the scissors comparable to current laparoscopic techniques. The use of cautery worked well to seal small vessels and aided in tissue dissection. Endoscopic tissue dissection and enterotomy creation was completed effectively though less efficient compared to laparoscopy primarily due to parallel device use imposed by the dual channel endoscope.